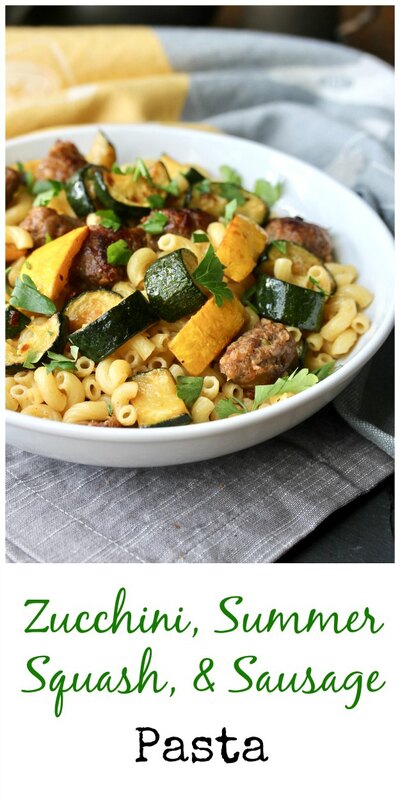 This Pasta with Zucchini, Summer Squash, and Sausage is so easy and delicious. 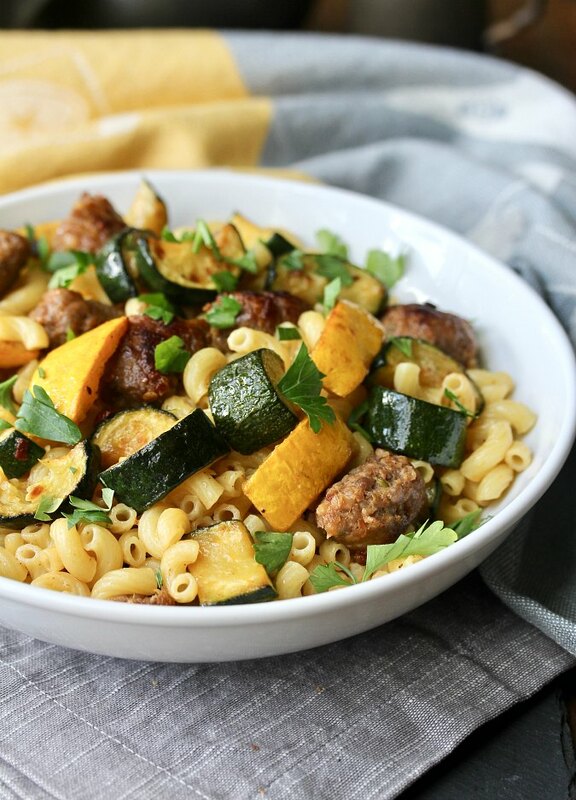 The zucchini and summer squash take on the flavors of the hot Italian sausage, as does the pasta, which is tossed in the flavorful oil from the cooked sausage. This sautéed zucchini and pasta with sausage is wonderful hot, fresh from the pan. It's also tasty at room temperature, as a potluck side dish. The dirty little secret is that it's just as good cold, straight from the refrigerator. I know this because every time I took out the leftovers to reheat them, I picked at the pasta way more than I'm willing to admit. This dish is easy and amazingly flavorful. I used hot Italian sausage, but you could use mild or sweet. As I mentioned earlier, I tossed the pasta in the sausage drippings to add even more flavor. If you prefer, you can substitute extra virgin olive oil for the sausage drippings. This recipe has been adapted from Mark Bittman's cookbook, Kitchen Matrix: More Than 700 Simple Recipes and Techniques to Mix and Match for Endless Possibilities. Camilla, Wendy, and I are taking a year to cook our way through sections of the book. We take lots of liberties, but stay within the spirit of the book. This week we are cooking from the chapter, Zucchini +12 Ways. The flavor of zucchini and other summer squash is pretty mild, and probably under appreciated. You can eat it raw, grilled, sautéed, and even microwaved. It's great at taking on the flavors of the seasonings and sauces you are using.. and it's excellent with cheese. It also stays fresh in your produce drawer for a very long time, way longer than most veggies, which means you can accept all of the zucchini, crookneck, and patty pan squash your crazy neighbors are offering you. Here are the #Matrix takes on zucchini. 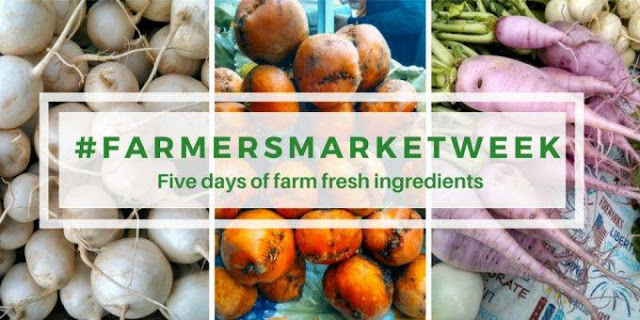 I'm also participating in #FarmersMarketWeek, hosted by Christie and Ellen. After the recipe, be sure to check out the rest of the recipes from all of my friends helping you make the most of the end of summer produce that you can find at farmers markets. Heat a large skillet over medium high heat and add the garlic and sausage. Cook until the sausage is cooked through. Using a slotted spoon, remove the sausage to a plate. Add the squash to the pan and sauté until lightly browned, about 10 minutes. While the squash is cooking, cook the pasta and drain it. 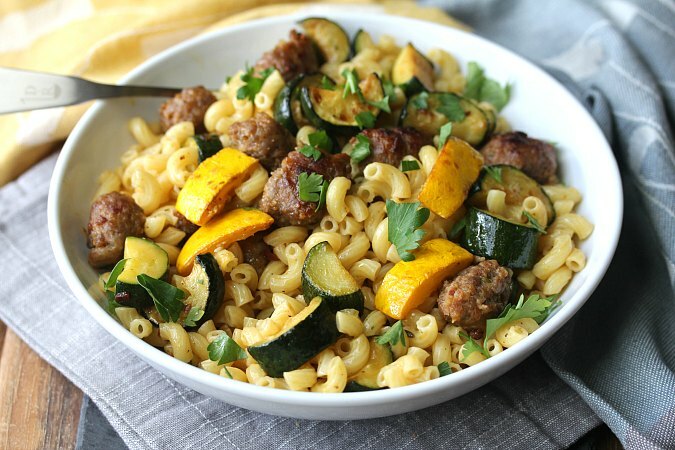 Place the cooked pasta into a large bowl, add the cooked sausage and the cooked zucchini/squash. Add the cooking juices by tablespoon to the bowl, and toss to coat the pasta. I added all of the cooking juices. Sprinkle with the parsley, salt and pepper to taste, and crushed red pepper to taste. Serve hot or at room temperature. I love quick and easy supper ideas for this time of year. More time to play. Thanks Karen. Looks very light and fresh! I would be picking at it too if I were there. What a tasty way to use up some zucchini! That looks like an absolutely perfect dinner to me! Mmmmm! Thank you. All in one bowl! So much vibrant colors and flavors. The best of summer in a bowl.